The FORGE crew celebrated the opening of the program’s new location with an open house on Saturday, June 16. Three months, ago, FORGE Youth & Family Academy was in limbo, having been turned down by the Town of Selbyville in its attempt to move its youth center into a vacant property in the town. A lot can change in a few weeks. The center, which had been located in the House of Mercy on Route 113 south of Selbyville, was founded by husband-and-wife team Rob Shrieves and Tara Barrett three years ago this month. In that time, the couple have built a program that serves at-risk youth, first in Sussex County, and now, in several more. Having been stymied in Selbyville, in May, FORGE moved to a storefront in Pittsville, Md., about 10 minutes from Selbyville. The new location, Shrieves said, was located by one of the adult volunteers in the program. Thanks to other volunteers, the new site is now up and running. The center has been freshly painted and features a new stage, colorful lighting for the Friday-night gatherings, a small kitchen, an air hockey table, a big-screen TV, and plenty of room for photos of FORGE activities and storage for awards and trophies already accumulating on a new shelf. The kitchen, Shrieves said, has helped facilitate the program’s Friday-night meals, which have turned into lessons in how to eat a meal with other people, Shrieves said. 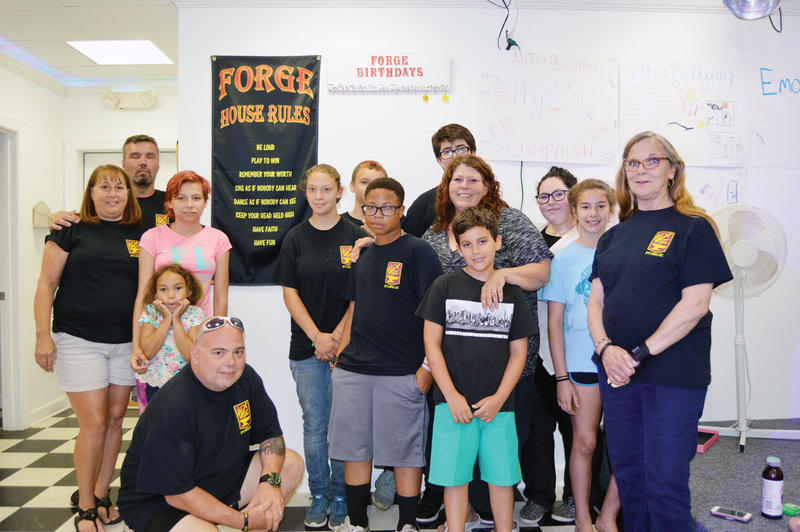 FORGE provides programs for youth who agree to attend weekly meetings, where they gather for fun and for support from adult volunteers, according to Shrieves. In addition to the weekly gatherings, members can attend activities, such as fishing trips and camping trips. And now that FORGE has its own bus, not only can youth from a wider area receive transportation to activities, but the group as a whole can go on day trips, such as a trip to Washington, D.C., now in planning stages, Shrieves said. The center now also has a piano, recently donated. “It does need tuning,” Shrieves said. He and Barrett are reaching out to area schools, resulting in a planned Bullying Summit for Wicomico County, Md., students. The idea came from a FORGE member who approached her school on her own, Shrieves said. The center also has its own music group, Exodus, which performs at area nursing homes. Because of donations, the move into the new center has cost the Shrieveses $300 total, Rob Shrieves said. That, he said, made up for the $1,000 they spent on application fees for their unsuccessful attempt to secure approval for the location in Selbyville. In addition to the meeting space, FORGE is also renting a space next door, which houses a thrift shop. Currently, the shop is divided into two parts, one which features used items and one that features new, donated items including custom-made mailboxes, T-shirts donated by a Fenwick Island beach sundries shop and colorful tote bags. In the coming months, Barrett said, the shop will begin to showcase items hand-crafted by teen FORGE members. “The line will be called “Hand Forged,” she said. Both Barrett and Shrieves said they have been overwhelmed with support, both from the community at large and the Town of Pittsville. “Pittsville has been wonderful to us,” Shrieves said.